Even though it is often considered generic fantasy, there is just something about D&D’s monster selection that’s not found in your typical fantasy game. You have floating balls full of eyes which can blast you into atoms; an aardvark that’s also a shark which burrows under the earth; a jello cube that eats people (but not their stuff)... a dolphin skeleton from another plane?! Uh… and also a psionic mole and giant mushrooms. It is profoundly silly, but it is also deadly serious and slightly disturbing: the screwed-up things you meet will eat you if you aren’t careful. This kind of weird dissonance is one of the great things about D&D, and the sensibility which has informed the first issue of this DCC fanzine. Crepuscular’s success comes from walking the fine line expertly. It is not afraid to be funny or silly (the cover might be an indication), but it is not afraid to kill your characters in gruesome yet hilarious ways either. Much of Crepuscular’s first issue is dedicated to Sanctum of the Snail, a 26-page romp through a dungeon that’s built around a mollusc theme. The characters are shipwrecked on a forlorn island that’s a bit like R’Lyeh, and their only way out of the monster-haunted reef leads down under the sea to a wondrous cavern system dedicated to Blorgamorg the Cthonic Snail, mollusc deity of the Cosmic Balance. It is a classical funnel in the sense that you push in the PCs at one end, and what comes out at the other will either be adventurers, or ground meat. There are plenty of killer encounters even when we discount the fragility of zero-level characters, and most of these ways to die have a satisfying splat factor (you can fall to your doom if you miss a jump, get lost in outer space, be mashed into a pulp by a piston mechanism, or choose between fiery death and drowning in a pit trap filled with oily water). However, the smart and lucky also gain access to some neat goodies: this is as much a chance to stock up as a place to weed out the weak, and the rewards are both generous and unique. The strength of the adventure lies in the well-designed encounters. The challenges involve navigation through dangerous terrain, uncovering ancient secrets (and dealing with what happens when you prod them), and combat with the Sanctum’s odd denizens. Plenty of magical and fantastic stuff. I think all, or almost all content here is new, from the oddball magic items to the creepy-crawlies you must fight. Crumbling stairs over a swirling sea divided between Law and Chaos; a gigantic dead turtle; the tomb of a hero and a summoning chamber. As you’d guess, there are a lot of slugs and slug-related squishy things, but there are also some neat elements related to the cosmic war between War and Chaos, as well as grotesque finds that are just there. This is imaginative, vivid stuff embodying D&D at its weirdest, put into the service of good gameplay (player creativity goes a long way here). The writing is good through the module; even the boxed text sticks to the essentials. Sanctum is not without problems. It follows a mostly linear structure, and the action is more focused on dealing with various encounters sequentially than on exploration. Like many DCC modules, it also lacks “breathing room” – every place has something going on, things are too close to each other, and it can feel a little busy. This is a legitimate way to construct an adventure, but a few more rooms with limited descriptive detail, or some more navigation-related content would have felt more right... as it is, the Sanctum does not really feel as large as the writeup would suggest; many of the spaces after the first few are decidedly on the small side. I would personally unwrap it on a slightly larger map to make finding various rooms more of an accomplishment. 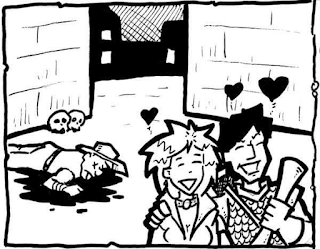 Crepuscular also offers a handful of miscellaneous articles (a little less than half the issue): a hilarious two-page comic, Blorgamorg as a DCC patron, two more unique magic items, and a d30 table of miscreants you can pick up as hirelings in the city of Xöthma-Ghül (to be presented in more detail in subsequent issues). These are all good, with the hirelings being my favourite – they range from “Tiberius Plum, man-at-arms; pragmatic, obsessed with the colour purple” to Quvark, a platypus man with a venomous heel-spur. Altogether, Crepuscular is an interesting, quirky take on DCC – consistently high-energy, somewhere in the middle between deadly and hilarious. The comedy ranges from the sly to the tremendously unsubtle, but somehow, it all works. 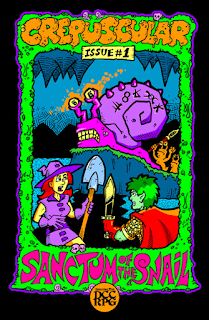 The snail theme doesn’t overstay its welcome, with enough variations to keep it from feeling one-note, and I am actually interested in learning more about the game world behind the zine. The module in the zine gives credit to its playtesters, and even an editor!